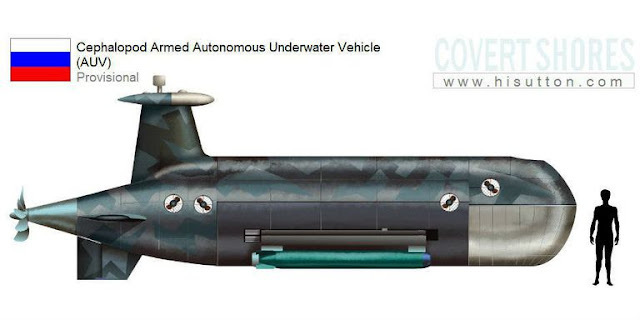 Russia is working on a new armed underwater drone designed to kill enemy submarines. The unmanned Cephalopod drone packs small, lightweight torpedoes capable of fatally wounding enemy submarines on the high pressure, underwater battlefield. According to undersea warfare expert HI Sutton, Russia has been working on the Cephalopod “killer underwater drone” since 2015, when its existence was revealed alongside the Poseidon nuclear apocalypse torpedo. Cephalopod was understandably overshadowed by the 100 megaton weapon, but in its own way is a threat to Western military might. We're facing a two headed monster of our own making. On one hand we have the Chinese that are building almost a mirror force to our own only bigger. They are seeking to meet us in a straight up fight using tactics and technology that we developed to destroy us. On the other hand we have the Russians that see over two dozen nations aligned against them and deciding to build a defensive force, yet one that is capable of winning against us in an asymmetric fashion. We (including me) got dazzled by the new armor concepts that they pushed. At some point in time the Russians decided to ditch trying to match/overmatch our capabilities and settled on being able to fight us in ways that would maximize our weakness while delivering measurable effects on the battlefield that we could not counter. The unmanned combat vehicles, upgraded tanks and aircraft, the new nuclear missiles, electronic warfare on the battlefield and cyber warfare on a strategic, tactical and information level will be the new keys to the kingdom. They already have formidable anti-ship missiles that have much more throw weight than anything found in the West (remember they built missiles that were designed to hit and cripple aircraft carriers much less anything smaller) so that leaves one thing. How do they counter our sub force? I think this gives clues on their thinking. Once again they're not coming straight at us to field newer, faster, deeper diving subs. Instead they're focusing on drones that they can send out and hunt our vaunted force. If they can go deep enough (and they should), fast enough (they should) and are quiet enough (should be) then our sub drivers might be facing a huge threat. This is one realm where I never considered drones to be useful but considering the life support requirements of a manned crew, it becomes obvious. This could be the future of undersea warfare. Not scouts but attackers.